1. 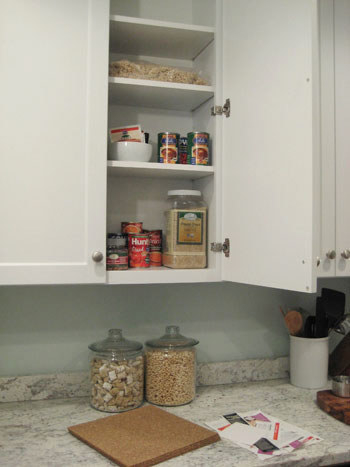 Stack your small and medium-sized storage containers in a single storage drawer — and store your larger ones on top. 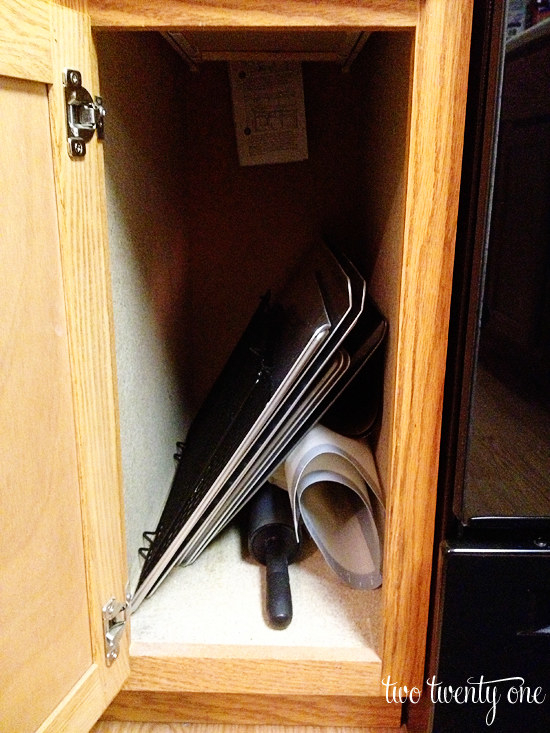 No more piles of containers that fall on you when you open your cabinet door — they're all contained by the drawer. (Not true? You may need a second drawer, or to pare down your collection). Get a similar drawer for $5.74 on Amazon, and see more of this organized kitchen on Polished Habitat. 2. Flip a magazine file on its side to make it easier to find the cans you need. Just add a stopper so the cans don't roll out — PB&J Stories straightened out two bobby pins here. You could also use zip ties, or maybe glue on a small piece of cardboard. 3. 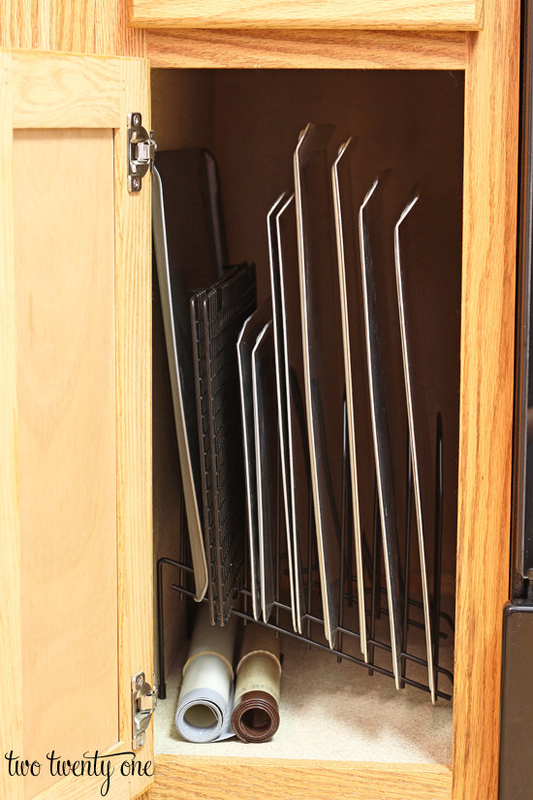 And repurpose an office file sorter to neatly sort your baking pans and cooling racks. No more shuffling through pans to find what you need! From Two Twenty One. 4. Glue magnets onto water cups so your kids (or you) only use one cup per day. For when they (or...you...) use a new cup every time they want a drink of water and suddenly there are a dozen water cups in the sink. From Adventures in Pinteresting. 5. 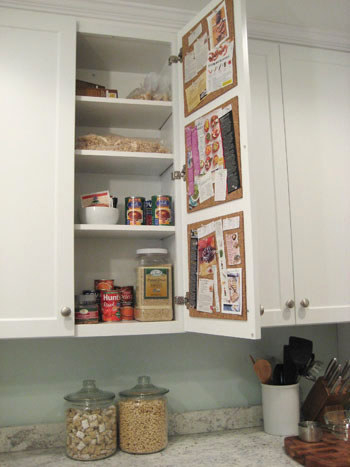 Mount cork squares on the inside of your kitchen cabinets to save recipes and conversion charts. Or use it as a command center, and pin up reminders, important phone numbers, and coupons. From Young House Love. 6. Hang an empty tissue box on the inside of a lower cabinet door to store extra plastic grocery bags. You could use thumbtacks or removable adhesive strips to pull this off. From Family Handyman. 7. Double the counter space in your tiny kitchen by attaching wine corks to the bottom of cutting boards. Get the tutorial on The Kitchn.